For this Central Austin loop, we'll ride through east, south, west and north Austin before returning to the Peddler. There are HILLS in South and West Austin and the ride includes an extension through Northwest Austin. This is a no drop ride and we will regroup at turns and hilltops as necessary. There will be a store stop on Lake Austin Blvd and coffee afterwards at Flight Path. Please plan to arrive 10 minutes before the ride starts for sign-in and safety briefing. 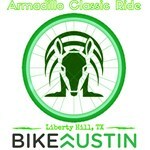 Ride Leader: Fran Gale Email: frangale226@gmail.com Phone:512 431-2631.